Max Pescatori was born in Milan, Italy in 1971 and is known as “The Italian Pirate.” Max Pescatori started playing poker when he was 15. He decided to move to Las Vegas in 1994 where he played seven card stud for a while before switching over to Texas Holdem. Valter Farina, the first Italian to ever win a World Series of Poker bracelet, became Max’s mentor in 1998. In 1999, Max Pescatori turned pro. Max Pescatori first big poker success came in 2003 at the World Poker Challenge in Reno, Nevada, where he won two events, Limit Holdem and Omaha Hi-Lo. Max Pescatori had a good 2004, making the money twice in the WSOP, making eight Ultimate Poker Challenge final tables in its first season and winning a Legends of Poker event. Max Pescatori made the money six times at the 2005 WSOP and won his first bracelet in the 2006 World Series of Poker. Max Pescatori won the $2500 No Limit Holdem event on the same day that Italy won the World Cup. 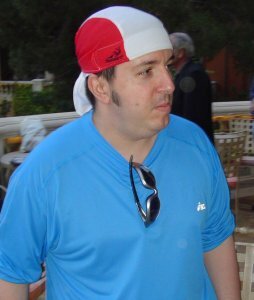 The timing was very fitting for this Italian poker player who is frequently seen at the poker table wearing an Italian bandana. Max Pescatori has made the money several times at the World Poker Tour but has not yet made a final table. In his amazing poker career, Max Pescatori has made more than $3 million, including tournament winnings. Max Pescatori hobbies are horse race betting, playing tennis and video games.